Gilbert Baker is dead. The designer of the rainbow flag, a worldwide symbol of the LGBQT movement, is being posthumously honored with a font named after him. Baker created the rainbow-colored flag in 1978, for the “Gay Freedom Day” in San Francisco. Each color represents a topic, like pink representing sexuality, or green as a symbol for nature. The catchy imagery quickly took on a life of its own and spread all over the world. In order to honor the activist and artist, who died in the end of March 2017, NYC Pride, the organizer of the annual Pride event as well as NewFest, the association of gay film and media artists, commissioned the development of a font that not only has Baker’s forename, but also captures the symbolism of his rainbow flag. 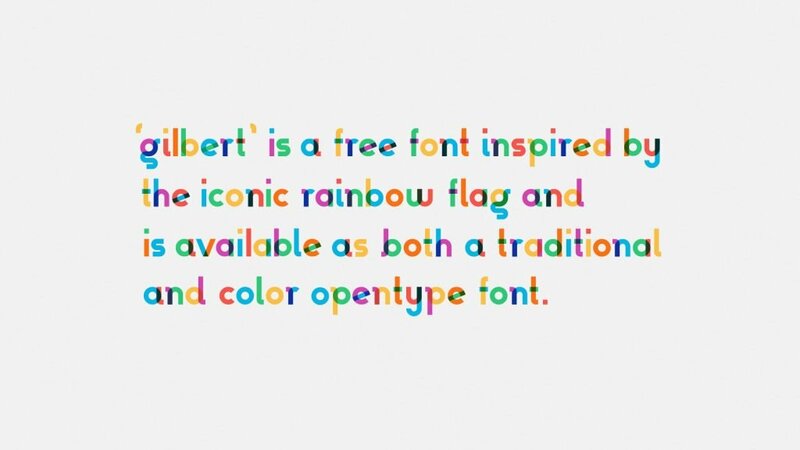 Like the flag itself, the font Gilbert is also available for free, and unconditionally. Under the motto “Type with Pride,” which is the name of the font’s website as well, Baker’s legacy will be carried on to the digital world. “Gilbert” is available as a monochrome font in the OpenType format OTF, and is usable with all operating systems that support OTF. The colored version is an OpenType-SVG version, which, at this point, can only be used and fully enjoyed by users of Photoshop CC 2017. “Gilbert Color” can still be installed on all operating systems that support OTF. In programs that don’t support the colors, “Gilbert Color” is simply displayed in its monochrome version. However, the color information remains. Thus, if you open a PSD including text formatted using “Gilbert Color” in Photoshop CC 2017, you get to enjoy the colors. On that, Adobe has got this help text for you. 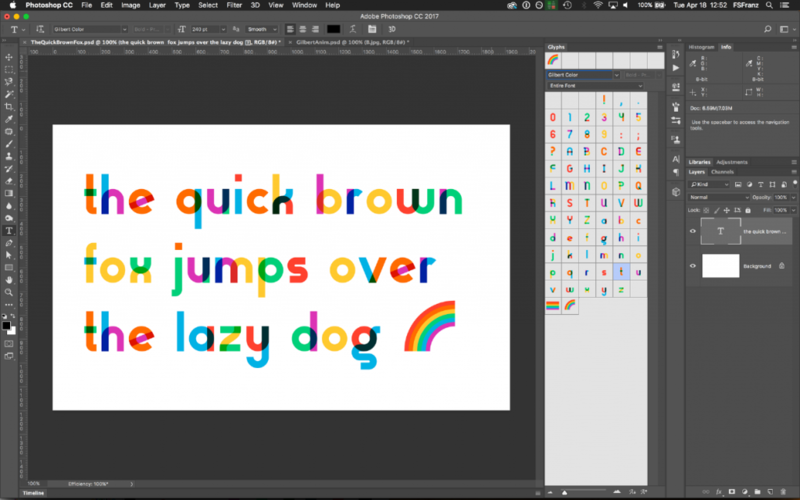 Colorful fonts, so-called Chromatic Fonts, are on the rise, and it probably won’t take long until we see color support in other programs. “Gilbert” is being distributed under the license Creative Commons Attribution Sharealike 4.0. This way, “Gilbert” can be used for free in both personal, and commercial projects, as long as a link to, or mention of the originator is given. If you make changes to the font, the license forces you to make the altered font available for free, under the same license. 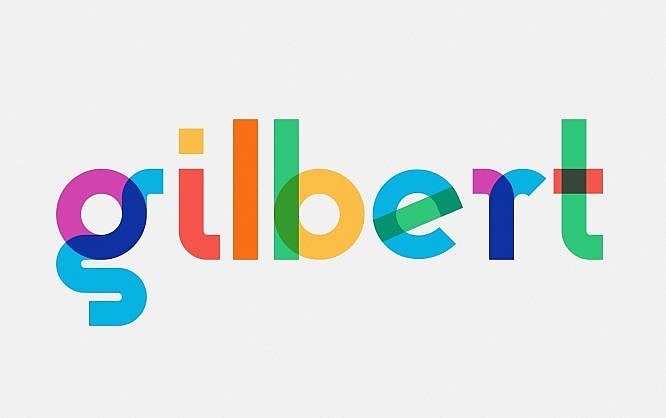 At the moment, “Gilbert” is more of a preview than a complete font. Nonetheless, the font is being worked on very actively. In this article, the font experts from Fontself explain how Ogilvy tasked them with the creation of the color version, and how they dealt with this challenge. The blog also serves as a source of information for the further expansion of the font. A full international support seems to be the next goal. Oooh.great. It’s looking awesome Ioanni Mitsakis. I will definitely try Gilbert for my work and I am damn sure it’s being a great experience for me. Thanks, Ioanni for this amazing information………….